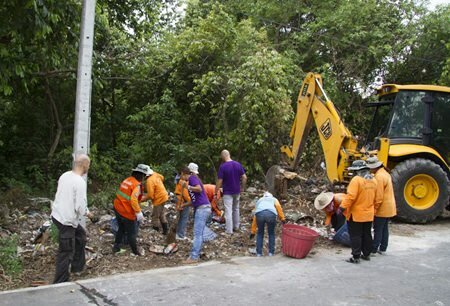 Over 6 trucks of rubbish were removed by community minded volunteers from MAYs Urban Thai Dine Pattaya, Kasetsin Group, Pattaya City Hall and the Green Pattaya Foundation, in a massive cleanup of Kasetsin Soi 5 on April 23. The area was so inundated with rubbish, city hall needed to bring in an excavator to help clear it out. Representatives from the aforementioned groups had been discussing the problem, and how they might be able to solve it. What they learned is that the area was being used as a dump, mostly by bus drivers and people in the area who wanted to avoid paying garbage fees. Volunteers from MAYs Urban Thai Dine Pattaya grab rakes and brooms to help clean up the litter. It was decided by all parties that there would be more cleanings in the future, and that Green Pattaya would inform city hall about the problem spots so that maybe city hall could do something about it. Time will tell. 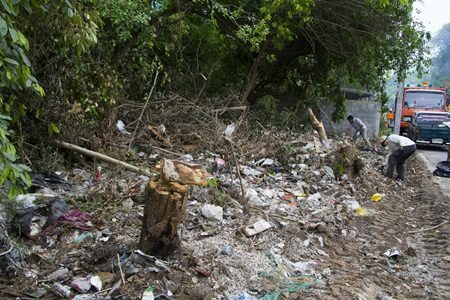 Over 6 trucks of rubbish were removed during a massive cleanup of Kasetsin Soi 5.